I’m happy to welcome author Daniel M. Bensen to the blog today! He has a new book you can really sink your teeth into… uh… sorry. We’re talking about a dinosaur book, so I can’t resist a few jokes. 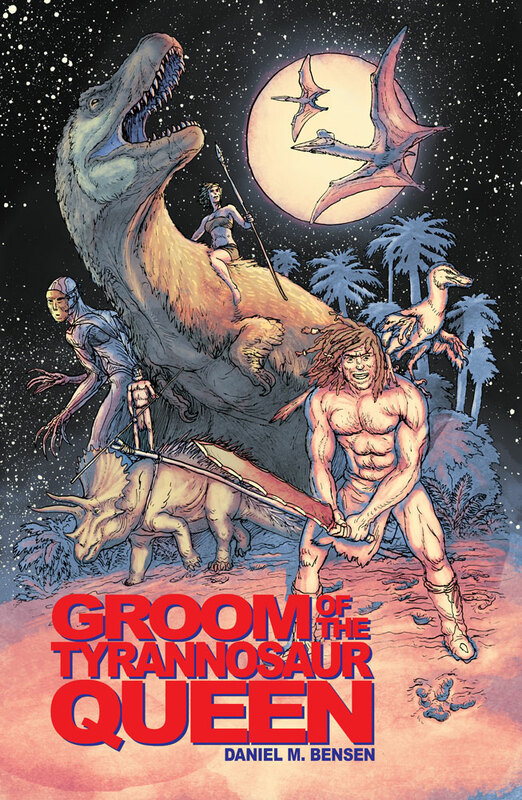 His new release is Groom of the Tyrannosaur Queen, a time-travel romance with adventure and dinosaurs. Let’s get to the meat of the post… here’s Daniel! You know what I hate about time travel? Time travel tropes. Oh no, the future is the past and the past is the future! It turns out that by trying to prevent the thing, you caused the thing! The 1983 you went to doesn’t exist anymore! Now you have to seduce your own grandmother and kill your grandfather, clearly. I didn’t want to write a book about time machines any more than George Miller wanted to write about cars. I wanted to write a book about bad-asses riding dinosaurs. So here’s how I worked it. And the science might even make sense. What Douglas Adams called “the Whole Sort of General Mishmash” has a real name coined by real theoretical physicists: phase space. A phase space is a way to represent a system, in which each possible state of the system is a given an “address.” Imagine every particle was given a set of coordinates depending on where it is, where it was, and where it could be. Move from one set of coordinates to another set, and you’ve moved through the history of a particle — you’ve traveled through time. You get into your time machine and select your destination — say 65 million years in the past. Your time machine then traces back the causal chain that ends with you until it arrives where you want it to be…more or less. For one thing, the time machine is only accurate to the closest ten thousand years, which makes it pretty useless for studying human history. The other, bigger problem is there is some “sideways” slippage as well. You may come out in a past, but it isn’t necessarily your past. You might find yourself in an alternate past where the Earth never formed, or where intelligent squids built a civilization before fish ever crawled out of the water. But don’t worry. The time machine in my story is much more accurate than that. It sends our heroes to a prehistoric past that is very nearly indistinguishable from the real Age of Dinosaurs. Except for the stone-age humans riding those dinosaurs around. Oops. So that’s where the actual story begins. There’s no worrying about changing the past, no possibility of fixing mistakes once you’ve made them. You just get in a machine and pilot it to a place where hairy men ride triceratopses and hurl spears at you. And take away your time machine. And your cybernetic enhancements. And marry you? Then things get strange. We don’t need messing around with the time stream to make them any stranger.